Tsuro is a tile-based board game designed by Tom McMurchie, originally published by WizKids and now published by Calliope Games. 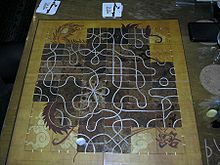 Tsuro is a board game for two to eight players. Each player takes their turn by selecting a tile from their "hand", and places the tile on the board to build a path that begins at the edge of the board and travels around the interior. The object of the game is to travel the path and to avoid ending your journey at the edge of the game board, and to be the last remaining piece in the play area. The board is a square, subdivided into a six-by-six grid of squares. The squares are the size of the tiles. Eight markers, differently-colored for identification, serve to represent up to eight players' individual positions on the board. The first edition box contains thirty-six tiles, but one--the dragon tile--is differentiated from the others by its front and back; there are, therefore, thirty-five standard tiles. The dragon tile is used to indicate the right to draw first in the event that the draw pile has run out and is then partly replenished by returning the unplayed tiles of an eliminated player. In editions by other companies there are 64 tiles and thus no need for a dragon tile as the draw pile never depletes fully. A standard playing tile has four sides, and four strings, each connected to the tile at either end, a standardized distance apart, meaning that any tile may be placed next to any other tile as part of a legitimate move, with any of the four edges abutting adjacent tiles, and still have all the lines of the tiles form contiguous "paths".